It is a refreshing activity to be able to tend to your garden after a hectic week at work as spending time close to nature alleviates stress. Gone are the days where you needed to go back and forth from your garden faucet to fetch water for your plants. 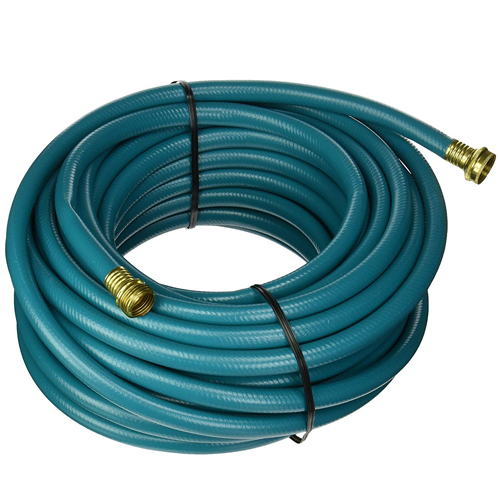 Nowadays, you can easily purchase an expandable hose to cover all the square foot of your garden. Watering all your garden plants is very essential especially on summer days so they will not wilt and continue to add beauty to your home. Whether you only have a small patio or an acre of land, owning a hose is recommended to complete your garden chores or other outdoor activities with ease. Spending a couple of hundred bucks on a good quality garden hose is one of the good decisions you have made as an adult. You can save thousands of dollars in the future for not choosing a flimsy hose that will only be working great for a number of times. Hoses can last up to a decade or more with proper care and maintenance. Here is a list of dos and donts to add years to your hose and enjoy more days beautifying your garden. Do not leave your hose under direct sunlight. Heat can cause the hose especially plastic hoses to be brittle thus decrease their lifespan. If you are living in the tropics or experiencing more hot days, place your hose under a shade or better keep it in your garage after using it. Drain all the water. Before the first snow makes landfall, it is recommended to drain all the water in the hose to avoid ice buildup. Iced water can cause the hose to lose its form and even puncture a hole or two. After using the hose, place the body of the hose on an elevated surface while the other end with the hole on the ground to ensure that all water is drained before storing it on its next use. Use a hose reel. It would be annoying to step on and trip on your hose whenever you are walking in your garden or when your kids are playing outside. Store your hose on a reel whatever of its length. You can purchase one from hardware stores and can be easily installed to a wall. Using a reel can also reduce and prevent kinks from forming adding more years to your hose. What is the best garden hose on the market? You may have a green thumb or know someone who loves gardening. 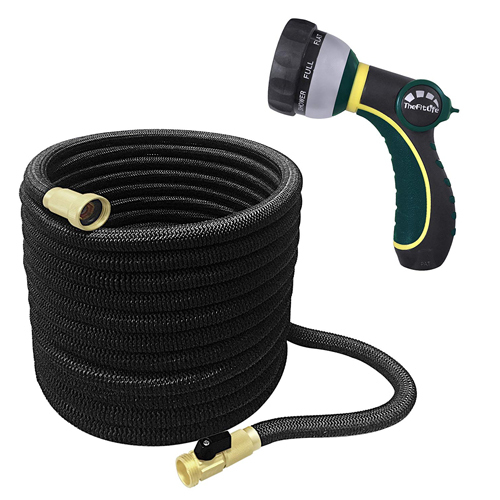 This hose might be a great gift that you or someone will enjoy to own. 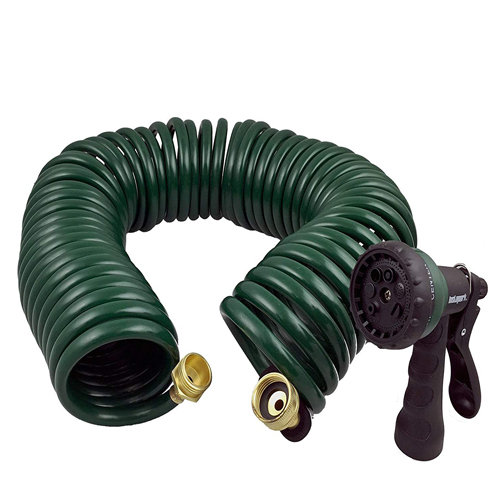 This hose is expandable that is great to use in a small patch of land or in a backyard. It expands3 times its original size as water pressure of 3-12 bar flows into it and gets smaller when no water is flowing. It has a free adjustable nozzle. The total length is 50 ft and weight is 3.35 lbs. This hose is made of high-quality flexible material. It has a low price for its high quality. This is very handy and easy to carry. It is durable even on rough terrains. Some experienced leakages after weeks of use. The nozzle spray is not powerful compared to other brands. If handled well and properly, you could enjoy using this hose for years without experiencing leaks. Keep it in the bag after use and in a shed so the changing of seasons will not damage it. What is the most durable garden hose? Sometimes you would need a high-pressure hose in clearing your driveway or cleaning your roof. This hose might give you a hand in these activities. 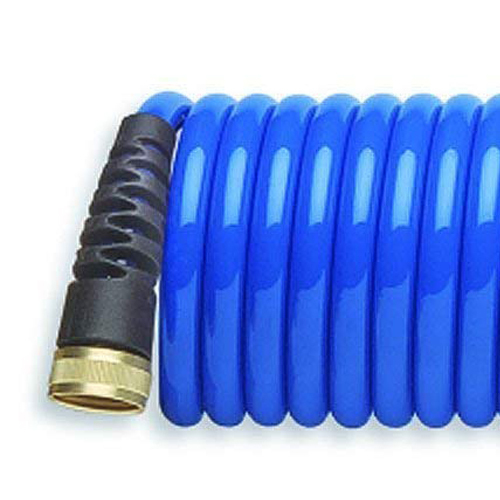 The expandable feature up to 50 ft of this garden hose will help anyone to reach the farthest garden patch in their property. This also includes an 8 unique modes of pattern spray to choose from that will suit you best. It is measured 20 ft expandable to 50 ft. The hose is made of high-quality rubber. The valve’s diameter is 3/4 inch. The hose is very flexible yet durable. It doubles its length when water flows in it. The spray patterns aid you in different garden activities. It takes time to fully drain the water. Some hoses burst at the initial water pressure. This can be a good choice for families who have an average-size house property as this hose can cover a great distance. A good tip is to turn the water on slowly so that the hose will not be overwhelmed by the sudden high pressure. Sometimes even after a rough estimate or measurement of your backyard, you would still end up getting a short garden hose. 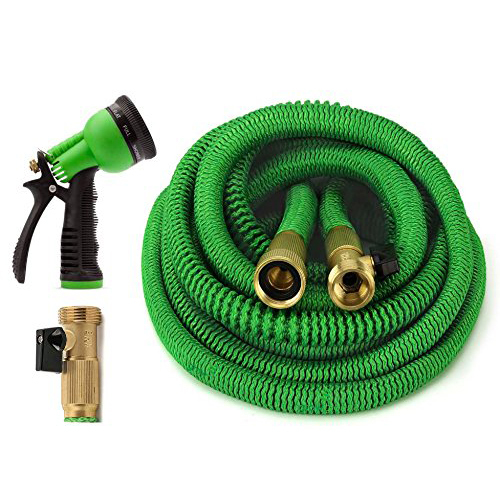 With this hose, you will surely not miss watering any patch of land. This hose is made of 100% latex making it very durable. This is available in different lengths that extends up to 3x its original length perfect for any size of a garden. It is equipped with a brass valve. A free 8-pattern spray nozzle is included. This is available in different lengths: 9 ft, 17 ft, 25 ft, and 33 ft.
A 9-foot hose can elongate up to 25 ft, 17 ft to 50 ft, 25 ft to 75 ft, and 33 ft to 100 ft. This can be connected to others to make a longer hose. The polyester outer covering protects the hose from getting punctured. Some say it does not produce water pressure without the spray nozzle. The outer covering gets shredded when dragged. This is great for people who are living in an apartment with a garden in the balcony as it is expandable when used and returns to its original small size for easy storage. Haven’t tried using a slinky hose? This might be your chance to experience one in your garden or in your car garage. This garden hose is EVA coiled and resembles the cord of a ‘90s landline phone and a slinky toy you might be playing as a kid. It looks small and compact but it has a total length of 50 ft. The hose has a weight of 2.5 lbs. It includes a manufacturer’ warranty of 1 year. This is great for bathing and giving water to farm animals. It easily elongates and gets back to its original shape and size. This can be easily used and carried by children and older people. Some find it shorter than advertised. The adjustable nozzle does not fit in the hose’s connector. Aside from using this in your garden or in your farm, you can bring it with you on vacations to create an outdoor shower when camping or just to clean your car. This is very compact and does not take too much space in your shed and in your trunk. One of the hoses in the Amazon’s Choice list you can consider is this one. 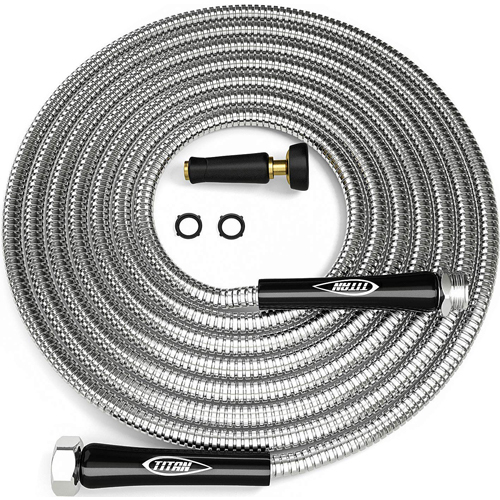 You might see yourself copping this hose after reading its review. This 2-ft hose can be extended up to 15 ft, talk about its compatibility! One can easily put it in their jeans pocket whenever they will take it outside or storing it in the garage. This also has a 2-year warranty to add assurance to their customers. The 3/4 connectors are made of brass. It only weighs at 5.6 ounces. This is made of high-quality upgraded polyether material. You can use it on your lawn, garage, as well as in your boat and RV. This is one of the lightest hoses in the market. It gives enough pressure to water delicate flowers in the garden and rinse off unwanted things in the driveway. This is not advisable to be used in large backyards. Some find it too short for an average-sized garden. If you want to get a separate hose for cleaning your vehicles, this is the perfect hose for your garage. If you grow a small garden in your veranda this will also do a great job in watering it. You may be leaning to get a stainless steel hose for your garden but are worried to burn your hand holding it in the summer months. Worry not, for this hose is resistant to the heat from the sun. This stainless steel hose is heat resistant making you water all your plants, especially during summer. Though made in stainless steel, this hose is lightweight. This hose weighs at 3.05 pounds. It is weatherproof, tearproof, and kink-proof. An adjustable 7-mode spray is included. It is sturdier than some collapsible hoses. This coils nicely when stored and minimal kinks are experienced. The connectors do not leak when under high water pressure. The length of the hose is only around 40 ft. It produces a little pressure. 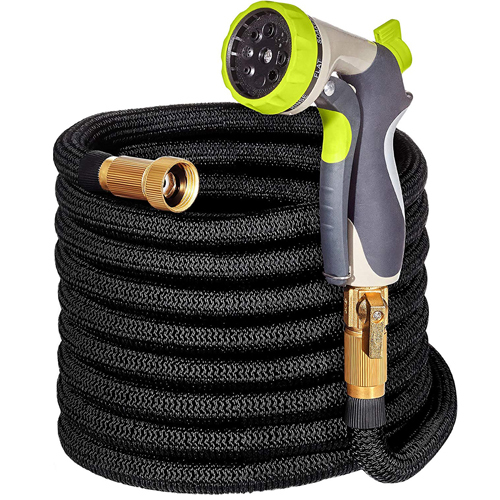 You will enjoy watering your plants with this hose as you can easily control the pressure via the nozzle spray. If you decide to get this hose, get one size longer than the one you intend to buy to cover all your garden area. Living in a country where extreme weather conditions are experienced, you will need a hose that is tough and durable that you can use all year round. is this hose the one you will be using forever? The advance flex ridge design allows you to use it in hot days of summer and freezing hours of winter. The hose is encased by stainless steel covering to protect it from thorns, bites, and tears. This hose is made with durable and high-quality 304 stainless steel. The inner hose’s diameter is 5/8 inch. You will never burn your hand when you touch it during hot days. It does not rust as the hose has chromium and nickel components. This is lightweight despite the materials used. Some find the inner hose smaller than what is described. The connectors are made of plastic, not brass. This will probably last for a lifetime if handled and used with care. This might not be the best choice in using at a farm, but this is great for gardens in the deserts or in the Alps. Do you trust products rated as Amazon’s Choice? Then this might be the best flex hose for you. 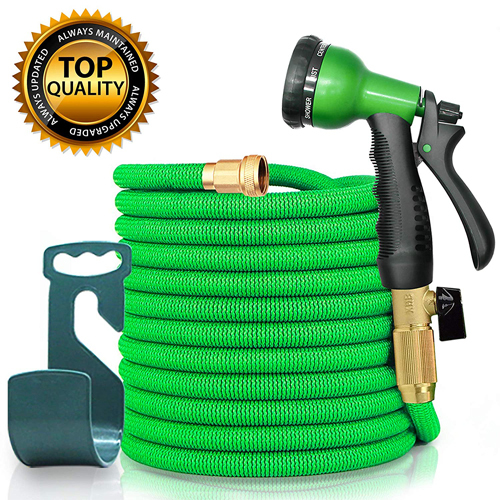 This hose is currently listed at a discounted price making you save 70% of its original price. This only weighs 2.5 lbs that children can also carry it around with no problem. All connectors are made of brass. Its original length is 17 ft expandable up to 50 ft.
An 8-way nozzle is included. It can take higher water pressure compared to average hoses. This is convenient to bring and store anywhere for its small size. This does not give off warm water even after exposing under the sun. Some experienced leaks after months of use. A few had their hose exploded from high pressure. Though some claimed that this hose gets blown up easily, with the right amount of initial water pressure you can avoid this to happen. You will surely love watering your garden using the nozzle spray. Are you looking for a more traditional hose? You can still buy one amidst the hype of modern and expandable hoses. Sometimes, the old design of hoses is better than some newly invented ones as it can be more durable and does not look complicated to use. This hose has full-flo brass couplings. It is made of reinforced vinyl. Its size is 1.5 inch by 75 ft. This is easy to wrap around a reel. Minimal to zero leaks are experienced by users. It is easy to carry around for it is lightweight. It gets easily bent stopping the water flow. Some experienced using it without loosening the kinks. If you are not the type who gets easily annoyed with kinks, this is a good hose for you for its price and durability. It would be a good idea to pull it softly from its reel while using it to avoid kinks. Looking for a hose that will complement your modern house exterior? 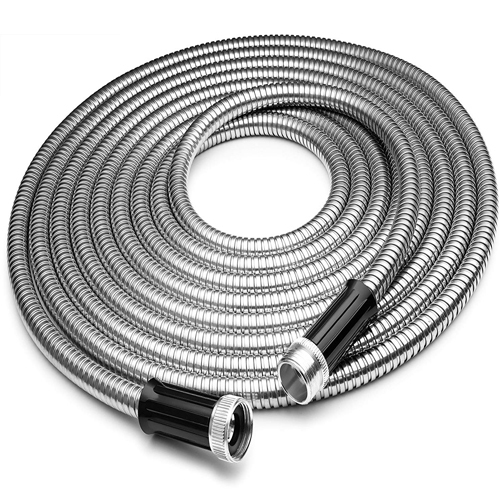 This stainless steel hose might catch your attention. 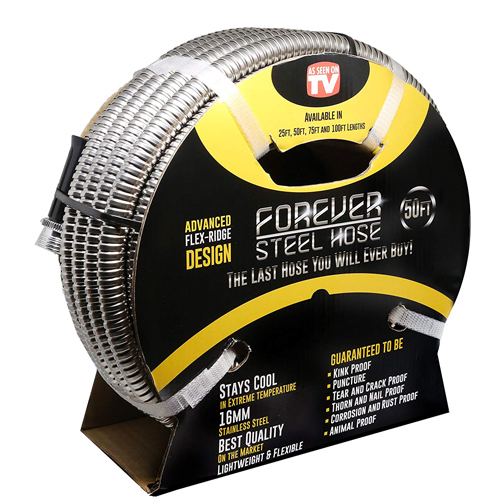 This stainless steel hose is lightweight even though it is designed to look tough and heavy-duty. Due to its design, it looks like it will not get tangled and cause knots. It uses 16 gauge 304 stainless steel. This includes a brass spray nozzle. This is easy to use and handle in any direction. Dogs and other animals cannot chew and cause punctures to it. Many claimed that it never kinks. It develops rust after some time. The stainless steel covering is of poor quality. Though this may look good and unique in your garden, you need to be extra careful in putting water pressure in it as it seems that inner plastic tube is not that durable. A Heavy Duty Garden Hose is a Gardener’s Best Friend. With thousands claiming they are the best heavy-duty garden hose, it would be really confusing to get the perfect one for you especially if it is your first time investing on one. So before you get hypnotized by a home shopping channel host to call and make an order, be guided with this so you can purchase a hose that you really need and use in your lawn or flower bed. Material – Choose a hose that can withstand your country’s climate. A vinyl hose is great to use in mild climate locations while rubber hoses are best in countries with most extreme weathers. Length – Consider the area of your garden or property first when buying a hose. It is advisable to get a 25-ft long hose for small gardens and a hose with a length of 100 ft for larger outdoor areas. Brass Fittings – A high-quality hose has brass fittings and connectors as it indicates minimal water leaks. Check if the connectors of the hose you are an eyeing are made of cast brass and pair it with a brass nozzle so your hose will last longer. Home or Commercial Use – An expandable hose stretches out when used then shrink to a small size for easy storage at home. Or you may be needing a hose for your commercial business and a regular hose might not cover the job. There are reinforced hoses that are puncture resistant if you will be placing one in a yard full of equipment and sharp objects. Industrial hoses are made of high-quality rubber that is used for bursting extremely high-temperature water. There are many types of hoses available depending on where you will need one. With Antimicrobial Protection – Do your kids love drinking water from a hose after playing outdoors? Or do you plan using the hose in filling up your pool? There are hoses with micro shield guard to prevent the growth of bacteria, fungus, and mold in it making it safe to drink water from. Whether you need a flexible garden hose or an expandable hose for your garden, it is always best to make a research first before making an impulsive buy on the first hose you see in a hardware store. This will help you to purchase that is best for your garden or even in your business. You can choose from a wide range of hoses that will help you save time in tending your patch of land and enjoy watching flowers bloom and trees grow. Not only that, but you can also use your hose in cleaning your car and clearing your garage driveway. You can even make your own rain in your garden for the kids during the hot summer days.